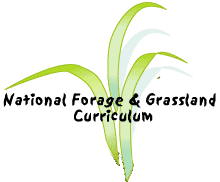 Grasses and other types of forage are consumed by all classes of domestic animals and many classes of wildlife although the various animals do not consume grasses in the same way or in the same amount. Different animals select, bite off, and chew plants differently. Each animal type has a tool or set of tools that help them gather food (prehension), grind it (mastication), and swallow (deglutition). Pigs use their snout to get the process started. Poultry scoop up food bits. This section discusses the main livestock involved in forage production; cows, sheep, goats, and horses. Forage-livestock managers should consider the differences in livestock grazing methods in establishing grazing programs. As herbivores, horses, goats, sheep, and dairy and beef cattle may get all their feed from forage. The differences in how much and what is consumed result from the different digestive systems and abilities to handle food containing celluloses and lignins. Cattle, sheep, and horses have advantages for utilization of forages over single-stomach animals. It is also important to look at how different animals chew their food and interact with a pasture to really understand how to best utilize the growth and regrowth of grasses. Animal consumption issues include palatability and digestibility of grasses, chewing habits, as well as the effects of trampling of grass plants by livestock, and the effects of pasture fouling by urine and manure. Equipped with a long and dexterous tongue, the cow can wrap its tongue around plant parts and pull the food into its mouth where it is placed between its lower jaw and a pad on the upper. Once in the mouth, the cow swings its head to severe the plant parts and chews the food slightly, and mixes it with saliva before swallowing. Later the cow will regurgitate the food to chew and grind it again. This process is called rumination or chewing the cud. The actual chewing portion of a cow's day consumes eight hours and ruminating takes about 12 hours. Cows can take around 890 bites per minute, 8 hours a day for about 130 pounds (59 kilograms) of food if conditions are optimal. Due to the design of the cow's lips, teeth, and jaw a cow can't easily get closer than 2 inches (5 centimeters) from the soil. An ideal height of grass is about 6 inches (15 centimeters), higher than that will consume more time and energy for the cow, minimizing growth. Cows will not work much longer than 8 hours to forage, so grass at the proper height will directly influence animal nutrition. Cows also prefer not to eat around their own paddies but are willing to graze after a different type of animal has defecated. Cows like to graze on rolling land, although they are able graze anywhere. As a heavier animal cows can inflict more damage onto a pasture than a lighter animal such as a sheep. Wet pastures are less able to bear the weight of the cow and wet pasture is more damaged then if it had been a dry field. While cows feed on the grass on the other side of a fence, they usually trample the area around the fence. While cows may best utilize their tongue, sheep use their lips and teeth as their primary tools. Cleft lips move away from their teeth on the lower jaw and help bring food in, while the upper jaw has a dental pad that is about 1.6 inches (4 centimeters) wide. Together, the teeth on the lower jaw and the pad on the upper jaw sever the leaf blades. Such a mouth structure allows sheep to bite closer to the ground and the ability to be more selective about the amount eaten. As a lighter animal, sheep do not cause the same amount of damage to pastures as do cows and horses. Much like sheep, goats also have teeth on their lower jaw and a strong pad on their upper lip. The upper lip is incredibly mobile and with the help of a strong tongue goats selectively grab and are able to avoid thorns and spines. But goats prefer woodier browse and find young, tender leaves and twigs to be their favorite. Goats will eat young trees. Unlike cows or sheep, a horse's day is focused less on eating, however, they still have useful tools for eating. Horses have upper and lower sets of front incisor teeth used primarily for biting while the back set of molars are used mainly for grinding food. A strong, sensitive, upper lip gathers the food and brings it to the incisors. Their short tongues are less essential to the eating process. The upper teeth are wider which causes wear on the teeth from grinding and sometimes there is a need for their teeth to be filed. Like cows, horses are also heavier animals. They too trample wet ground easily. Horses are often left outside during the winter causing their pasture to be badly trampled. Just as livestock performance is directly related to the quality of feed consumed, the productivity of forage plants is directly affected by their interaction with livestock. The plant-animal interaction can be harmful or beneficial. One wonderful part of the sustainable agriculture centers on the benefit of livestock fertilizing a pasture. The urine and manure recycled into the soil has many benefits but this recycling is random and, therefore, has different effects on the different plants within the field. The growth and regrowth of plants is directly influenced by fertilization. Some plants will receive too much urine or manure while others are not directly treated with one or either. Cattle defecate 11-12 times daily and urinate 8-11 times daily, with more dung being excreted at night than during the day. But dung pats cover less than 9.7 ft2 (0.9 m2) and urine patches 3.2-4.3 ft2 (0.3 to 0.4 m2). Many have learned that excreta is beneficial to a pasture but a small percentage of the acreage is affected especially since excreta is often concentrated near water or salt sources and shade spots. The problem is worse at low stocking rates than at high stocking rates on intensively managed pastrues. Only 10-15% of a pasture benefits from excrement. Urine deposits will provide concentrated N and K which stimulate grass growth. But the utilization of the possible N and K from the urine is influenced by moisture and temperature. Much of the nutrients are lost through leaching and volatilization (vaporization). Dung, however, provides P, Ca, and Mg and is often buried into the soil within 4-5 days by dung beetles. Without the beetles, dung deposits may remain for 3-12 months in the tropics. Livestock will quickly graze urine spots but will avoid the odor of dung deposits and eventually the less palatable grass plants that have matured there. Although most of the pasture is not greatly affected by excrement, managers can use this knowledge in determining traffic lanes, water locations, salt availability, day/night paddocks, and fertilizer needs. To a young grass seedling the size and grazing habits of the livestock on a pasture can mean total destruction. Every pasture will experience the loss of plant material because the plants could not survive the traffic of livestock. Certain species are more sensitive to trampling and the stage of maturity also influences the effect of heavy traffic. The size of the livestock also enters into the picture. Trampling, or treading as it is termed in some references, damages pastures of all soil types, soil moisture levels, plant species, or livestock species. Forage yields are reduced most when animals are allowed to graze plants on wet soils. Trampling is more adverse on clay soils than sandy. Shorter forage bears more damage than tall forages, and trampling promotes more prostrate than erect growth. And, of course, trampling packs the soil which reduces the moisture infiltration into the soil. The above generalities can lead a manager to consider what species will best tolerate livestock traffic. Then grass growth and regrowth concepts can be applied to the specific grazing system. Perennial ryegrass and white clover mixtures are more tolerant of trampling than orchardgrass or red clover.